This week we have a collection of cold winter scenes around L’Ardoise. Top left – Sunrise over the horizon in Chapel Cove. Top right – Baby seal in the backyard. 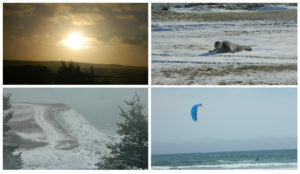 Bottom left – Snow storm on New Year’s Day. Just to warm things up a bit, the bottom right shot has a different feel. A kite surfing scene at Point Michaud Beach might be something to look forward to during these cold winter months! Thank you Jamie Boulet for sharing. Clicking on the photo will open a new window with a larger view. Click return to go back to the webpage.